Do not use the network to access or send any material not related to the lesson, objective, or assignment. Only approved educational games approved by your teacher can be accessed on the network. Do not allow other students to use your pass word or have access to your files. Do not attempt to send anonymous messages of any kind to anyone. 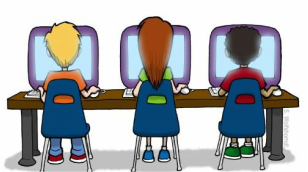 Do not use any digital means to conduct cyber-bullying or to participate in any harassing behavior which will threaten the health or welfare of other students. When finished on computer log completely off of computer. Students are not allowed to load any software on the computer, or use any programming code that might cause viruses, worms, Trojan horses, malware, or spyware. Do not bring food or drink around computers or any technology such as printers, digital cameras, or projectors. Printers are not to be used for any reason without permission from a teacher. Cell phones must be on vibrate in class. No texting or using social websites in class. Cell phones are only to be used in class when given permission by the teacher for academic purposes only. No pictures are to be taken in class for any reason on cellphones or other devices. ﻿Any recording devices, visual or auditory, cannot be used on cell phones or any other digital devices without the permission of the teacher and other students. Never attempt to fix technology problems yourself. Report the problem to your teacher or adult in charge. Website on how to properly use a cell phone in class.